← Savita. Ar dheis dé go raibh a hanam. 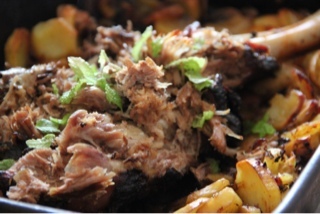 Low & slow shoulder of lamb…. I have said it before and I will say it again, I just love Sundays! Long hours stretching ahead full of pottering around the kitchen and a spot of relaxation awaits me after I arise. 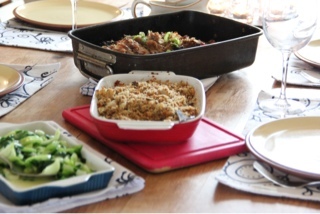 Nothing says Sunday more than a full table and a Sunday roast. I had a shoulder of lamb today which was a first for me but definitely not going to be the last time I cook it, it was meltingly delicious. I made a rub comprising of a bunch of chopped rosemary leaves, some thyme leaves, zest and juice of a lemon, two teaspoons of honey, salt, pepper and some rapeseed oil. Put little slits all over the shoulder before rubbing in the mixture. 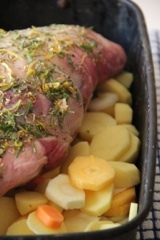 Place on a bed of root vegetables before placing in a preheated oven at 180 degrees. Immediately drop the heat to 150 degrees and leave until meat is easily shredded with two forks. I cooked mine for four hours, before shredding it and devouring some in the kitchen! Sprinkle some chopped mint leaves on top before serving with some herby stuffing and some flash fried pak choi for a delicious and super simple Sunday lunch. 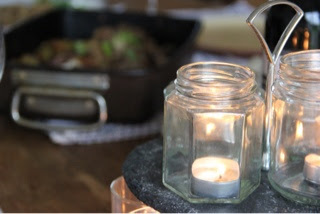 If you are looking for me you will find me on the sofa………..
2 Responses to Low & slow shoulder of lamb…. It is not my first time to visit this web site, i am browsing this web page dailly and get good facts from here every day.